Here is a copy of the translated Japanese auction sheet. 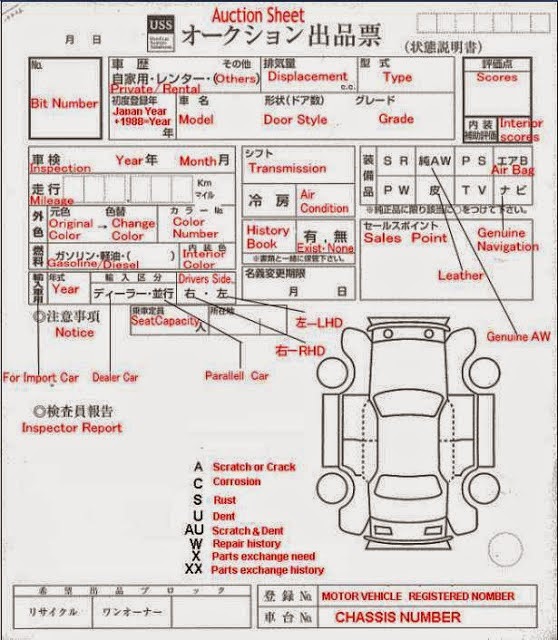 Most people can't read Japanese, but with this translated sheet, you should be able to figure out what the excellent Japanese grading sheet tells you. This sheet is from USS Auction. Not every car comes from the auction, so not every car will have an auction grading sheet. 6 or higher As good as new. Exterior and interior are in immaculate condition. Some cars in these grades have never been driven. 5 A car does't need repair. A car has been repaired slightly, and the repair is in very good condition. No body parts have been changed. 4.5 A car has been repaired slightly, and the repair is in good condition. It becomes a grade-5 car with slight repair. There are a few slight scratches or dents. 4 A car is in good overall condition, but there are a few scratches or dents. 3.5 A car has some conspicuous scratches or dents. Some car's head-light support panel or back panel have been repaired. 3 A car has many conspicuous scratches or dents. A car has some paint blemishes. RA A car which has had accident damage which can be ranked MINOR, and has been repaired. ***/0 A car which has had accident damage, and has NOT been repaired yet. Or a car withan engine that does not work with major engine trouble. A1 A scrape/scratch which is the size of a fist. A2 A scrape/scratch which is the size of two palms. A3 A scrape/scratch which is more than the size of A2. E2 A few dents which are barely visible..
U3 A dent which is more than the size of U2.